One lesson from the 1979 Iranian revolution and the 2011 Arab revolutions is that activists seeking to promote women’s rights, human rights and the transition to democracy must challenge patriarchy from within the Muslim legal tradition. Islam’s textual sources (the Qur’an and Sunna, the practice of the Prophet) are the source of Muslim ethical values and norms. They have been articulated, since the beginning, mainly by Muslim scholars. Central to these values, and to the philosophy of law in Islam, is justice, which the classical jurists endeavoured to translate into legal rulings. But the rulings that have come down to us rest on pre-modern conceptions of justice, gender and rights, which entitled individuals to different rights on the basis of faith, status and gender. These rulings continue to be regarded as the established interpretations of the Shari‘a. In the course of the 20th century they came to be confronted by modern conceptions of justice and rights, and the ideals of universal human rights, equality and personal freedom. In this encounter some Muslims came to see these rulings as unjust and discriminatory, and the textual sources on which they were justified as hypocritical, or at best contradictory.
" The fundamentals of the Shari’ah are rooted in wisdom and promotion of the welfare of human beings in this life and the Hereafter. Shari’ah embraces Justice, Kindness, the Common Good and Wisdom. Any rule that departs from justice to injustice, from kindness to harshness, from the common good to harm, or from rationality to absurdity cannot be part of Shari’ah." " The wife is her husband’s prisoner, a prisoner being akin to a slave. The Prophet directed men to support their wives by feeding them with their own food and clothing them with their own clothes; he said the same about maintaining a slave." Both statements were made by the same scholar, Ibn Qayyim al-Jawziyya, a 14th-century jurist and one of the great reformers of his time, who became the source of inspiration for many 20th-century Islamists. But through modern eyes the two statements seem poles apart. The first, which depicts the ideal of Shari‘a as the divine and just law, speaks to all contemporary Muslims, and both advocates of gender equality and their opponents often use it as an epigraph. The second statement reflects how marriage and gender relations came to be defined by medieval jurists. The idea of a wife as prisoner or slave of her husband seems incompatible with a law that embraces justice, kindness, and wisdom. Consequently, Muslim legal tradition and its textual sources have come to appear hypocritical or at best self-contradictory. This faces those who struggle to reform Muslim family laws with difficult questions: What really is the notion of justice in Islam’s sacred texts? Does it include the notion of equality for women before the law? If so, how are we to understand those elements of the primary sources of the Shari‘a that appear not to treat men and women as equals? Can gender equality and Shari‘a-based laws go together? Such questions are central to the on-going struggle for an egalitarian construction of family laws in Muslim contexts, and have been vigorously debated among Muslims since the late nineteenth century. They are at the core of a new book – Gender and Equality in Muslim Family Laws – that offers a new framework for rethinking the old formulations so as to reflect contemporary realities and understandings of marriage, justice, ethics and gender rights. Based on fieldwork in family courts, and illuminated by insights from scholars and clerics from Morocco, Egypt, Iran, Pakistan and Indonesia, as well as by the experiences of human rights and women’s rights activists, the book identifies several approaches that resolve and transcend what many still regard as an irreconcilable conflict of ideas and practices. Gender equality is a modern ideal, which only recently, with the expansion of human rights and feminist discourses, has become inherent to generally accepted conceptions of justice. In Islam, as in other religious traditions, the idea of equality between men and women was neither relevant to notions of justice nor part of the juristic landscape. To use an idiom from Muslim juristic tradition, gender equality is a ‘newly created issue’, that is, an issue for which there are no previous rulings. Simply put, gender equality is a problem that Muslim jurists did not have to address until the 20th century. In other words, the idea of gender equality created an epistemological crisis in Muslim legal tradition that Muslims have been trying to meet, with varying degrees of success, since the late 19th century. The break-through, however, came in the second part of the 20th century with the emergence of new reformist and feminist voices and scholarship in Islam that have challenged the patriarchal ethics of Muslim family laws. This challenge needs to be placed in two related contexts. The first is the encounter between two radically opposed value systems, one rooted in pre-modern conceptions of justice, gender and rights, as embodied in classical jurists’ rulings that sanction discrimination on the basis of gender, the other shaped by the contemporary ideals of human rights, equality and personal autonomy, based in international human rights standards and documents and advocated by feminism. This encounter has produced a dialogue between proponents of Muslim law and international human rights law that is undermining the patriarchal understandings of Shari‘a. The second context is that of 20th-century shifts, both globally and locally, in the politics of religion, law and gender, and the changed relations between fiqh (Islamic jurisprudence), state and social practice in the Muslim world. Here, a number of developments were important. The partial reform and codification of fiqh rulings in many Muslims countries in the first part of the century led to the creation of a hybrid family law that was neither classical fiqh nor Western. Codes and statute books took the place of fiqh manuals; family law was no longer solely a matter for private scholars – the fuqaha – operating within a particular fiqh school, rather it became the concern of the legislative assembly of a particular nation-state. In practice this worked against women, as patriarchal interpretations of the Shari‘a acquired a new life and unprecedented power; they could now be imposed through the machinery of the modern nation-state, which had neither the religious legitimacy nor the inclination to challenge them. Confined to the ivory tower of the seminaries, Islamic legal theory became more and more scholastic, as jurists lost touch with changing political realities and were unable to meet the epistemological challenges of modernity, such as the idea of gender equality. The religious tone of those areas, notably family law, where fiqh remained the basis was reinforced as they turned into the last bastion of Islamic legal tradition, to be guarded at all costs. With the rise of political Islam in the late 20th century, Islamist political movements became closely identified with patriarchal notions of gender drawn from classical fiqh. Political Islam and its slogan of ‘Return to Shari‘a’, which in practice amounted to little more than translating into policy pre-modern juristic rulings on gender relations and the family, provoked criticism and spurred women to increased activism. Islamists’ defence of patriarchal rulings as ‘God’s Law’, as the authentic ‘Islamic’ way of life, brought the classical fiqh books out of the closet, and unintentionally exposed them to critical scrutiny and public debate. This opened a space, an arena, for an internal critique of patriarchal readings of the Shari‘a that was unprecedented in Muslim history. A growing number of women came to question whether there was any inherent or logical link between Islamic ideals and patriarchy. By the early 1990s, many women (and some men) had acquired a new consciousness, a new way of thinking about gender, and were arguing for equality for women on all fronts within the framework of Islam. This new approach has been nurtured by reformist and feminist scholarship in Islam that is both uncovering a hidden history and rereading textual sources to unveil an egalitarian interpretation of the sacred texts. At the same time, the expansion of human rights ideals and instruments, in particular the Convention on Elimination of all forms of Discrimination Against Women (CEDAW), gave women’s rights activists what they needed most: a point of reference, a language and organizational tools for their struggle to resist the regressive policies of political Islam. The 1980s saw the rise of an international women’s movement, and women’s NGOs with international funds and transnational links gave women a voice in policymaking and public debate over the law. Further, new approaches to Islamic legal tradition have been facilitated since the late 20th century by the rapid spread of new technologies, notably the internet. Now, both recognized religious authorities and those with other interpretations and agendas, not least women scholars and lay people, are engaging in debate and criticism of interpretations, old and new, of texts and legal concepts; and these new technologies regularly show their potential for the mobilization of campaigns for change. New and egalitarian readings of Islam’s sacred texts have challenged patriarchal dogmas, which are losing their theological validity and their power to convince. In short, 20th century developments not only made gender equality inherent to widely accepted conceptions of justice, but also made the intimate links between theology and politics increasingly transparent. This led to the emergence of feminist voices and scholarship in Islam, which by the new century came to constitute an internal critique of the patriarchal ethics of Muslim legal tradition that cannot be ignored. They are forcing the tradition to assimilate an idea that until recently was considered alien: the idea of gender equality. The Iranian revolution of 1979 and the Arab revolutions of 2011 clearly demonstrated that in Muslim contexts women’s rights are vulnerable to local power struggles between forces with other priorities. Islamist elements that tend to win popular support in times of upheaval are almost always motivated by traditionalist patriarchal assumptions and policies. To challenge them effectively, defenders of women’s rights, and, in turn, human rights and the transition to democracy, must engage with the Muslim legal tradition on which these assumptions are founded. One of the main contributions of feminist voices and scholarship in Islam is to unmask the power politics that are defended in the guise of religious values and Shari‘a; in doing so they are creating a public voice that can break down ideological polarizations such as those between ‘secular’ and ‘religious’ feminism, and between ‘Islam’ and ‘human rights’, and point us to the main battleground, which is that between patriarchy and despotism on the one hand, and gender equality and democracy on the other. 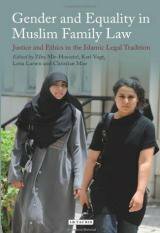 Gender and Equality in Muslim Family Law: Justice and Ethics in the Islamic Legal Tradition, edited by Ziba Mir-Hosseini, Kari Vogt, Lena Larsen and Christian Moe (London, IB Tauris) was launched on 27 April, 2013 at SOAS. The book results from the project 'New Directions in Islamic Thought and Practice' of the Oslo Coalition on Freedom of Religion or Belief.